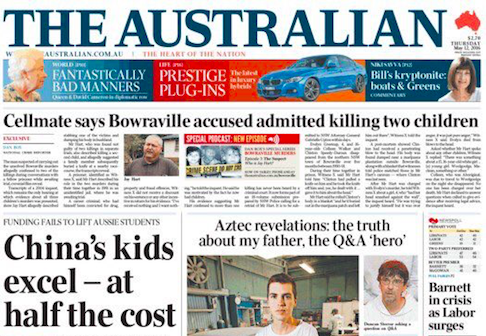 News Corp’s The Australian has seen its Monday to Friday print circulation slip below the 100,000 as rival Fairfax Media masthead, The Australian Financial Review, dropped below 50,000. According to the latest figures from the Audit Bureau of Circulations, national broadsheet The Australian had a March to June / Monday to Friday print circulation of 99,027 – a year-on-year decline of 2.50% – down from 101,615 in the same period last year. Andrew Jaspan, editor of The Conversation and former editor of The Age, suggested that the figure is meaningless and “nobody really cares anymore” about the circulation figures. “It’s kind of ‘so what’? What does below or above 100 really mean anymore?” he said. “Nobody really cares anymore, we’ve moved into a post-circulation age, nobody really cares or knows if these numbers are robust or not. A News Corp spokesperson focused on the broadsheet’s EMMA, which measures total audience, results when asked if the decline was a disappointment. “The EMMA results show The Australian has improved its print audience by 3.6% compared with last year. In addition, the ABC data shows digital subscriptions are up almost 12% compared with last year. The Australian has a total paid audience of over 178,000 – this base is growing and transitioning,” the said. It was a bigger drop for Fairfax’s AFR, which saw its circulation slide by 12.80% from 57,243 to 49,900. Sticking with Fairfax Media, the Sydney Morning Herald saw its Monday to Friday print circulation dive below the 100,000 mark for the first time, after posting a circulation decline of 8.20%. The Sydney paper was, on average, selling 107,291 copies each week day during the March to June quarter of last year; however, during the same time this year the paper was only shifting on average 98,472 copies a day during the week. The Age also posted a Monday to Friday decline of 7.8%, dropping from 100,339 last year to 92,481. Fairfax Media has made its intentions in print quite clear, with the company emphasising its digital strategy and suggesting that it is “inevitable” that the publisher will axe the Monday to Friday print editions of both the Sydney Morning Herald and The Age. Speculation suggests the publisher will move ahead with the drastic decision before the year is out; however, no timeline was put in place at the company’s recent financial results presentation. Greg Hywood, CEO at Fairfax Media, told investors: “In terms of digital-only publishing, we have been pretty clear that we will do it when it is beneficial to the business and when it meets consumer demand. Looking at these [financial] results we are not there yet but inevitably we will be. Fairfax Media also did not report any digital figures, having withdrawn from the digital audit last week and while News Corp has questioned the validity of the metric, it has made no move to withdraw yet. Damian Eales, managing director – metro and regional publishers for News Corp Australia, told The Australian: “The Fairfax action raises the question about the validity of the whole audit process going forward – digital and print. Eales asserts the industry favours The Readership Works’ Enhanced Media Metrics Australia figures, which measures readership rather than circulation. According to the audit figures, The Australian increased its digital subscriptions by 11.8% from, 70,698 in the March to June quarter of 2015 to 79,018 in this quarter. The Weekend Australian had a similar increase – up 11.6% from 70,798 to 78,997. News Corp’s Herald Sun had a dramatic increase of 23.40%, with digital subscribers growing from 59,545 last year to 73,470. While News Corp subscriptions allow access to its suite of metro products – with the exception of The Australian – the audit calculates the subscription on point of entry and News Corp refuses to release digital subscription data for the Daily Telegraph, The Courier Mail and Adelaide Advertiser. News Corp declined to comment on whether the publisher would withdraw from the audit or if it would consider submitting its other mastheads to the audit. Returning to the Monday to Friday print circulations, it was the Canberra Times which experienced the greatest decline, down by 11.5% from 19,492 to 17,244. News Corp’s Daily Telegraph saw its Monday to Friday circulation slip by 6.9%, from 256,835 to 2930,018, while the Herald Sun saw its circ dip by 3.9% from 344,061 to 330,766, but it remains the highest-selling Monday to Friday newspaper. The Northern Territory News was down 9.5% from 14,214 to 12,870; The Courier Mail slid by 5.3% from 155,282 to 147,122; and The Advertiser was down 7.10% from 130,136 to 120,931. The Mercury saw its Monday to Friday circulation drop by 3.70% from 31,627 to 30,452 and the West Australian declined 9.30% from 157,011 to 142,393. Moving on to the Saturday editions, it was Seven West Media’s West Australian that posted the greatest decline, with its circulation slipping by 12.40% from 265,143 to 232,176. The Canberra Times Saturday edition dipped from 30,280 to 26,894 – a drop of 11.20% – while The Daily Telegraph declined by 4.50% from 244,587 to 233,546. Fairfax Media’s Sydney Morning Herald Saturday paper posted a decline of 6.30% from 199,472 to 186,918; while The Age dipped 7.20% from 172,280 to 159,801. The Northern Territory News dropped 12.5% from 19,709 to 17,252; The Courier Mail dipped by 4.80% from 188,217 to 179,149; and The Advertiser’s Saturday circulation slid by 5.2% from 171.730 to 162,731. The Mercury was down by 6.20% from 43,612 to 40,918. The Herald Sun posted a Saturday circulation of 335,232, down from 357,230 – a decline of 3.50%. Amongst the Sunday editions, it was Fairfax Media’s Sun-Herald that posted the greatest decline, with its circulation down 11.10% from 212,280 to 188,806, while the Sunday Age declined 8.20%, from 139,989 to 128,478. The Sunday Telegraph remains the highest-selling Sunday masthead with a circulation of 410,137 – down from 439,926 in the March to June quarter of last year. The Canberra Times posted a Sunday circulation of 18,305 from 20,312 last year, a decline of 9.90%; while The Sunday Territorian was down 6.10% from 15,144 to 14,214. Queensland’s Sunday Mail was down 6.90% from 342,381 to 318,830, while South Australia’s Sunday Mail was down 2.70%, from 205,643 to 200,103. The Sunday Tasmanian posted a circulation decline of 4.90% from 40,916 to 38,925. The Sunday Herald Sun was down 3.90% from 400,657 to 384,993, whereas the Sunday Times was down 4.80% from 193,842 to 184,486. Thanks Daniel S, you are most right. I find it astonishing that Fairfax want to race to be the Digital heroes of news when the population have no brand loyalty on digital news. They certainly did have known and loved brands for the printed titles they seem to be harpooning – very odd behaviour, can’t understand why shareholders would value a company kissing goodbye to millions of dollars in this way. Jaspan remains clueless about the business. Think of this: national newspapers are printed in many places. Printing is a manufacturing process and a scale business. It is certain now that the AFR is wasting more copies starting the press in most places than it is selling. It is possible that this is also true of the oz in some cases. On these numbers both the oz and afr will be losing quite a lot of money. The AFR has cut back its core staff and that’s showing in the cratering sales. The big question is: can Mr Hall outlast Mr Hambly? Game over, I suspect. It’s not just about total print and digital readership for every advertiser. Print circulation numbers do matter, and having an accurate measure of them matters too. Canny advertisers still like print, but only if they can trust the numbers and if publishers accept that the rate will have to fall with sales. Publishers may be making a mistake if they glibly assume those advertisers will migrate all their print advertising dollars to digital if and when the printing presses are finally silenced. There’s no evidence that newspaper web sites make enough dough to pay the staff cost. So it’s fair to assume that the bills get paid by print income. In which case what’s totally clear is that some of these titles are dead in the water. On these numbers the AFR, weekday SMH and Australian and the Age all are simply hanging around in the hope that someone else goes first. Publishers asking EMMA for readership numbers is like the Evil Queen asking the mirror if she’s the fairest of them all. Miranda is smashing it today, great coverage! Shame about the double digit slide for the Fin, I think it’s clearly the best print daily in AUS. Hope they keep Aston & Laura Tingle. 1212: is Aston the loser on the back page who goes on about his lame celebrity and on one memorable occasion referred to his erection?? Yes Aston is the “loser” on the back page. The, um, loser who won a Kennedy Award for his writing earlier this month: https://mumbrella.com.au/fairfax-journos-win-13-trophies-nsw-journalism-kennedy-awards-387922. A few years back, News Ltd got $b for the imputed value of the masthead in some tax dodge. What goes up goes down: now its dropped, do the shareholders get to be told the value has gone?